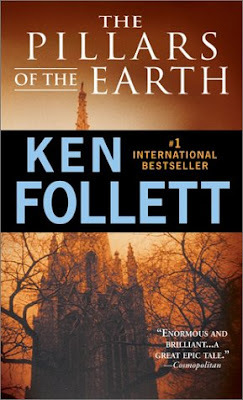 I'm reading The Pillars of the Earth by Ken Follet, and I have to say I'm really loving it. At first my reading pace was slow, and the book being almost 900 pages my progress was not apparent. But then once the pages start turning, you can't stop them. The other night I stayed up till 1 am reading this book (that's 5 hours straight), and I had to make myself go to sleep to wake up early the next morning. Yes folks it's that good! It surprised me that I like this book, since the book is set in the 1400's and I'm not such a big fan of oldtime books, but the language used here is neither boring nor hard to comprehend. Which is great, obviously. You're introduced to several different characters and the story is told from different prospectives, and what I like about it is that each event is not repeated through every POV but they complement each other and the story goes on without making the reader feel lost. I cannot wait to finish this book (got about 120 pages to go) so that I can run to the bookstore and get the sequel World Without End.